Like ancient Egypt, Greek myths, and, erm, Elvis Presley, if there's one theme that slots developers go back to time and time again like a dog returning to an old bone, it's the fantasy theme. 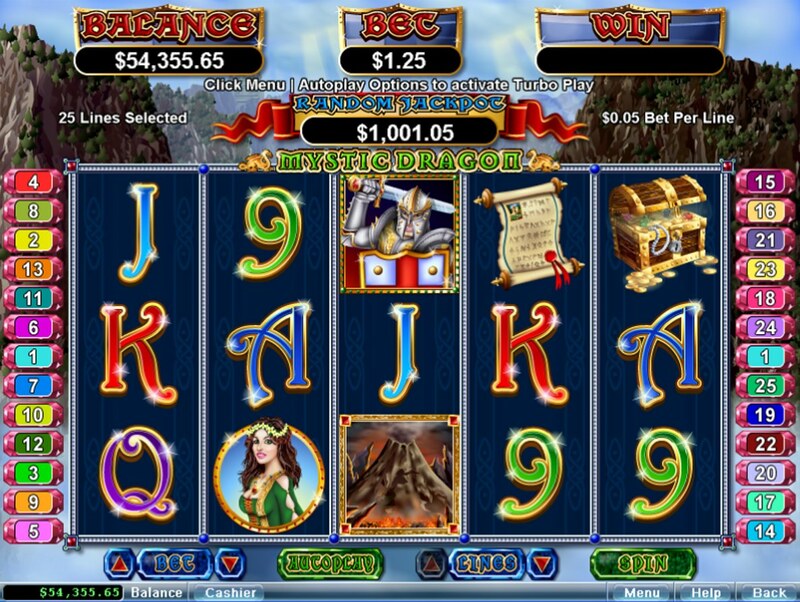 World renowned IGT's two excellent fantasy roleplay-themed Dungeons & Dragons slots including the atmospheric Dungeons & Dragons: Crystal Caverns set the benchmark, of course, but slot developer RTG have made a decent (iron-clad) fist of things with Mystic Dragon, their 5 reel, 25 pay-line video slot. Betting starts at just $0.01, but with a progressive jackpot on offer for the top spenders (awarded at random) and a tried and trusted theme, this should be a winner with players everywhere. Set within the confines of a fantasy land packed with dragons, knights, and not a grumpy Scottish ogre in sight, there are plenty of images to put you in the mood: the hero knight, the beautiful princess, treasure chests, dragons, volcanoes and castles - it's like being at Las Vegas's Excalibur hotel but better. Very medieval-looking 9-through-Ace symbols complete the reels. The big scary dragon is the game's Wild, and only appears on reels 2, 3 and 4. He substitutes for all symbols other than the Scatter. 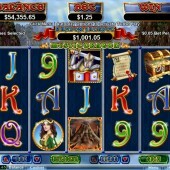 Dragon-forming winning combos pay you double your money. The Scatter, meanwhile, is the fiery Volcano icon. Three or more of these on the reels awards you free spins - not just ordinary free spins, though, but up to 100 if you bag five Scatters on the reels. If 100 free spins sounds good, remember also that the Dragon Wild comes into play during the freebies, appearing as Stacked Wilds. With some truly fantastic free spins rewards, together with a Progressive Jackpot that should have the punters flocking in, RTG certainly could have a winner on their hands. Mystic Dragon looks great, plays seamlessly, and has the tools to joust with the best of them. It's almost made me put away D&D: Crystal Castles in favor of this, and that's a big recommendation.